We're still celebrating the holidays and the joyous world of mushrooming! This month we're picking the last of the chanterelles and the early hedgehogs. Good fortunate smiled on us recently with the discovery of a cauliflower that we turned into a savory creation which we've named Cauliflower & Beef Filo Roll. Served with a wild greens and mandarin salad and topped off with the last lovely slices of our creamy Pumpkin Cheesecake from Bo's Desserts, it was a great way to start off the New Year! Oh, you're right. The dessert was a little too rich but, after all, we are still celebrating the holidays! Miss Manners is prepared to sweep through your mushroom hunting territory and get rid of all those lurking traces of rudeness that you are pretending don't exist. You know that you are not going to enjoy a pleasant and peaceful foray unless you eliminate and erase all potential incidents of rudeness! Waste not, want not. Gather only mushrooms that you will use. Process them promptly – either by serving them fresh, or by preserving them. Allowing mushrooms to rot after gathering them is the worst kind of wastefulness, declares Miss Manners, and may incur both her wrath and the wrath of the mushroom gods! 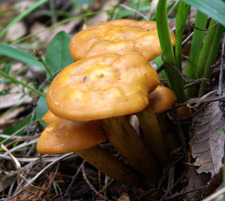 Even though you may try to “waste not,” there are times when you may discover at home that some of the mushrooms you gathered were not in as good a condition as you thought when you picked them. Miss Manners dictates that these should be disposed of in a suitable place in the woods, along with the trimmings from other mushrooms. They may contribute to future crops. No! No! No! Never destroy unwanted mushrooms unnecessarily (e.g., kick them over, step on them, etc.). They all have their place in the environment, if not our basket, philosophizes Miss Manners. If you are not certain a mushroom is one you want for the table, the only reason to pick it is for subsequent identification at home with your books. Keep such mushrooms segregated in separate paper bags in your basket; don’t mix them up with others. Be cautious, warns Miss Manners! If you see on picking a mushroom that it isn’t one you want to take home, replace it as you found it. The spores will still drop and hopefully propagate, as nature intended. Miss Manners doesn't approve of spoiling the natural order of the universe. Pick up litter whenever you possibly can. Tut, tut, people can be so rude, bemoans Miss Manners. Besides, if you don’t do it, who will? Oh, my, says Miss Manners, if you don’t, it will be there to “greet” you the next time you're there, and since litter seems to attract litter, it will probably have multiplied. When harvesting mushrooms, replace all divots. This protects the remaining mycelia, and also conceals from others who follow that you found a mushroom there! In areas where mushrooms are dense, try to minimize the amount of walking around. Excess foot traffic compresses the loose surface duff, making it more difficult for mushrooms to sprout and possibly affecting the mycelia. Always take, at a minimum, a compass with you when going into the woods, and use it. It is not difficult to get turned around, even in areas you’ve been in before. Feeling lost is no fun, and having to be rescued is even less fun. Miss Manners would be chagrined to find herself on the front page of the newspaper for having been rescued! Accept the fact that mushrooming can be competitive. While other people have as much right to gather mushrooms on public lands as you do, you are under no obligation to show them your “patches” and don’t expect them to show you theirs. Never knowingly lead others to a mushroom patch. Tread lightly, and try to eliminate any sign of your ever having been there. Never reveal a precise mushroom patch to others outside your immediate group. To do so deprives them of the sense of accomplishment they feel when they discover a good patch on their own, and of developing the base of knowledge that comes from that effort. It also makes it less likely that these patches will continue to be productive for you. At the same time, accept that other people will inevitably “find” some of your patches, despite your best efforts. Be philosophical about it. You can try to get to these favorite patches before your competitors do, but you must also regularly explore new areas and discover productive new patches to supplement or replace those that have been discovered by others. Keep a very detailed log. It will contribute greatly to your knowledge over the years, and guide you to where your chances might be best. Miss Manners believes that organization can contribute to one's success in many fields, not just in mushrooming. Is it a leaf or a chanterelle? It's the 'shroomers, the mushroomers that make this activity so very special in Curry County. And, we'd like to introduce you to some of these extraordinary people. Oysters courtesy of Sue Dawson. Please come back and visit this post again and again. We're in the process of interviewing more Curry County 'shroomers, including a professional and an amateur cultivator. Fresh shiitakes! We've grown them on the shiitake blocks that we purchased from the Oregon Mycological Society at their recent show in Portland. The blocks were guaranteed to fruit at Christmas time ... but, as we all know, mushrooms fruit when they want to. Although it's only the first of December, we've had shiitakes since Thanksgiving! Regardless of when the blocks fruit, they are a welcome guest in our home! 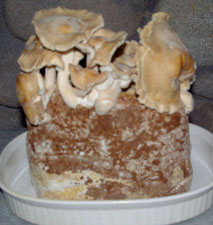 The first flush of shiitakes produced about a pound of mushrooms. We're expecting another 2 to 3 fruitings over the next month of so. Company's coming, and we're showing off with this fresh shiitake and salmon showpiece, Salmon Salad after Six! We'll start off with small bowls of miso soup and accompany the salad with loaves of bread from the wood-fried oven at the Hideaway Bakery in Eugene, which comes highly recommended by Gold Beach mushroomer Dave Manzella. Who can even think of dessert after such a feast? Still, a small glass of vintage port might be a welcome finish! The warm, late summer has suddenly ended, leaving me gasping! I wasn't prepared to let go of our sunny days and balmy nights for this weekend's wintry environment of rains and winds. Still, in spite of the weather, I'm mushrooming and finding a host of gifts: golden and white chanterelles, pigs ears, and cauliflower along with a host of boletes, including admirable, fibillorous, orange capped, king and queen. What a gift this mushroom season has been with its variety and abundance! 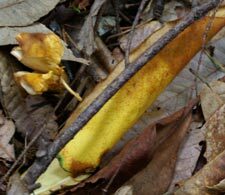 Today's foray offered an extraordinary experience: our first orange capped boletes. 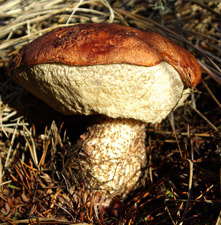 Standing tall in the duff, the boletes revealed a deep orange-red cap, lightly touched with fog and slightly sticky. The white-fleshed stem was elongated and covered with rough gray/black points, occasionally staining blue in the base of some specimens. And, the loveliest surprise of all: a flesh that slowly turned to lilac-gray in some places where it was sliced. I saved some of the caps for an appetizer but the remaining caps and stems quickly went into the dehydrator. I usually prefer my boletes dried simply because the dehydrating process and then storing the dried product for some period of time seems to intensify the flavor and aroma. Today, thanks to nature's bounty of fresh boletes this year, I'm planning a light dinner around small plates of fresh mushroom offerings: Quick Fried Boletes on Cracked Wheat Sourdough Bread, Shrimp and Chanterelle Fritters. I'm complimenting these small dishes with a wild greens salad and Hot Sichuan-Style Green Beans. A selection of several varieties of Oregon pears drizzled with annisette is a refreshing finish to the fungal feast.